If you were to just open your computer or pick up any book that is related to career advice, You are bound to find a great deal of advice where you are being told incredibly optimistic and clichéd things which do not even hold much weight in the real world in which we are living. Surviving nowadays in the business world is a challenging task in itself and in order to move up in life and become successful, it is important that you see things for what they really are and follow these unique bits of advice which no one ever mentions. It is often said that money is not everything and sometimes experience and knowledge matters more than something as materialistic as money. To some extent this is true, but along with this, you ought to remember that a company which values you and your services will never allow you to feel overworked and underpaid at any point in time. Top companies which really appreciate their workforce` always ensure that they reward their employees well and make them feel content. So do not sell yourself short, ensure that you are happy with the salary which you are getting. You need not give any company your charity. Having a good and honourable person as a boss is very important indeed. If you have a good boss, not only will working for him be an absolute delight, but in addition to this you will also be able to learn a lot of things from him. The right kind of boss is going to bring out the best in you and encourage you to do the best that you can do at all costs. Great bosses are those experienced and skilled professionals who will show you by example how things are to be done in the business world and how you ought to conduct yourself in order to gradually make it to the top of your field. An important and unique piece of advice which nobody ever mentions is that the company which you work for and the brand which you associate yourself with is very important indeed. Having a job is very important but ensure that you do not accept just any job which comes your way. Never accept a job which you are embarrassed about mentioning on your CV. So always make sure that you wait for the right job to come along. Waiting for your dream job might take a while, but ensure that you do yourself this honor. You can use the mean time to brush up on your skills as well as your technical knowledge. You might be forced to leave a job for various reasons. The job might be too stressful; you feel like they do not appreciate you enough or you cannot work in the negative office environment. All these reasons are completely justified and at no point in time should you go against your own wishes, yet this having been stated, ensure that you do not have a huge gap in between jobs as that is something which is going to look very bad on your resume. Having a good looking career graph is very important. You must show that you are someone who has steadily grown and achieved more over time. You will commonly hear that you ought to do your best and then you will automatically reap rich dividends. To a certain amount, this is correct, yet at the same time you should realize that having an eye on those who you consider your competition is very important indeed. Keeping an eye on your competition is important as then you can know what they are up to, yet in addition to that seeing the growth which they are having will serve as a catalyst to make you want to do better and better. Doing this is very positive indeed as such competition is bound to bring out the best in you at every stage. While in the office, try your best to establish a friendly relation with those who are intellectually superior to you, as doing this is going to help you in a number of ways. Getting acquainted with their manner of thinking and their approach to problem-solving is going to help you a great deal in your career. Just because someone is better than you it does not mean that you feel threatened and start avoiding them. You too can improve yourself and become like them, simply by working on your own skills and trying to learn new things every single day. Along the way, there will be many people who will tell you that asking is a sign of weakness and only those who are stupid ask questions, thereby revealing their ignorance. Yet this is something which is absolutely false. Though it is popularly believed that only silly people ask questions, but in actual fact, asking questions is a sign of a curious, scientific bend of mind. It is only people who are smart that are able to rationalize things out and come up with questions. So do ask as many questions as you want to and rather than making mistakes. This is one of the most important and unique career-related advice which can be given to you. At all points in time, it is important that you realize that every bit of work which you give up in your name is a reflection of you. Your promotions and salary hikes are all going to depend on the work which you do. Even if you give up ten perfect pieces of work, even one bad piece of work on your part is really going to tarnish your image. So you must ensure that at all points of time you do work which is to the best of your ability and which you are proud of. You will often be told that since you will get paid at the end of the month anyway, therefore you should always do the bare minimum as doing any more than that is just not worth the time and effort. This is something which is false and no one will tell you about how important it is to use every opportunity which is given to you. You might think that you spending that extra hour in the office is not being noticed, but you can be rest assured that your boss is noticing it and making a quiet note of it as well. As we are taught from a very young age, that failure is a stepping stone towards success. When people give you career advice, they are bound to tell you that success is everything and all projects undertaken by you should have a positive outcome, no one is going to say that making your share of mistakes is fine and that taking risks is something which is very necessary in the business world. Sometimes risks pay off and often they don’t, but that does not mean that you stop taking the plunge when you truly have faith in something. Taking calculated risks is very important. Blindly having implicit faith in someone in the corporate world is something that is very risky indeed. In fact it is a risk which is almost never going to pay off. No matter what, you should always have your wits about you and ensure that you have your head on your shoulders at all points in time. It is vital that you do not try to make best friends with your co-workers as none of them will ever think twice before using you for their own benefit. Maintain whatever relationships you want outside the confines of the office, but in the office, look out for your own needs. No matter what you have to go through in the office, it is important that your confidence levels do not flounder at any point in time. A unique and important piece of advice to keep in mind is that having confidence in yourself is very important indeed and your confidence will be able to help you a great deal, not only in the course of your career but also in life. As long as you have courage in your convictions and stand by your beliefs, no one will have the courage to challenge you. If you do not believe in yourself no one will place their trust in you. Talking the talk is not merely as important as walking the walk. Don’t be someone who makes empty promises as people like this are not respected in the least bit at the office. So be someone who lets their work speak for itself. Never go about blowing your own trumpet or advertising yourself as this is something which no one is going to buy. People want to see results and the numbers should be able to speak for itself. Respect is something which is very important indeed. Respect once lost is never easily regained once more. A unique piece of advice which no one will ever tell you is that you must not be someone who is an overreacher trying to get to the top without having started from the bottom. It is very important to be meticulous in your attitude to work. Ensure that you do everything one step at a time and do not try too many things at one time. So take things as they come, plan for the future but ensure that you are not counting your chickens before they are hatched. Living in the past or in the future, has no meaning, rather, ensure that you make the most of each moment. Lastly, no one will mention this point to you and even if they do, they will never stress on it enough! Expanding your contacts is very important indeed. If you wish to move ahead in the business world it is important that you are open to meeting new people and expanding your horizons, as this is going to help you a great deal in the long run. Do not be closed and seeking isolation as that is not going to help you at all. Networking is something which is very important in this day and age. 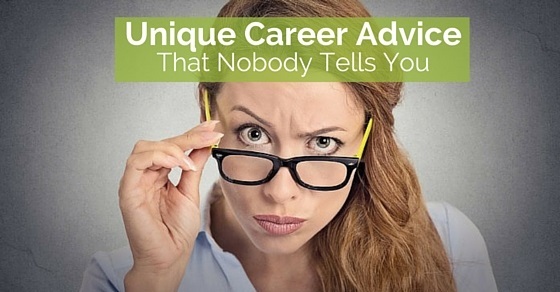 These unique bits of career advice which nobody ever mentions are like pearls of wisdom which need to be paid attention to no matter what. It is better to heed the advice being given to you rather than having to learn things the hard way. Trusting people blindly or thinking that things are going to be really easy for you is absolutely wrong. You must be willing to start at the grassroots level and make it up from there. Throughout your career it is very important to remain attentive to your surroundings so that you are never taken for a ride by cheats.